Writings on ending speciesism, living a low-cost healthy life with diabetes , and the amazing ways the two topics intersect. A while back, I bought a pizza stone at Goodwill for, I think, $5.99, which seemed to be a really good deal to me. I had never made my own pizza, but I’d been known to bake bread on occasion, and I thought a baking stone might be just what I needed. This weekend, I finally made my own pizza. I still had a lot of tomato sauce in my freezer from making extra when I made that eggplant parmesan a couple weeks ago, so I decided to make conventional pizza. That is, not highbrow pizza — no tofu ricotta, no pesto of any sort, just dough, sauce, vegan cheese, and toppings. I know, I know, pre-made vegan cheese is not exactly the tastiest thing ever. But I’m actually used to it, and also, I think it tastes pretty good cold, less good hot. Making pizza dough is fun! I always get a little thrill from leaving dough to rise, coming back, and seeing it has doubled in size. Pizza dough gets especially spongey and stretchable. Then you get to stretch it! You can stretch however you please, use any shaping methods you are capable of, shape it however you want to — or, more likely, however close to a circle you can manage. Pizza dough does seem to have a mind of its own. It won’t give in too easily to your stretching whims. I want to go to a local pizzeria and watch some professionals in action, maybe learn to do that whole pie tossing thing — what do you think? Think I could learn it? 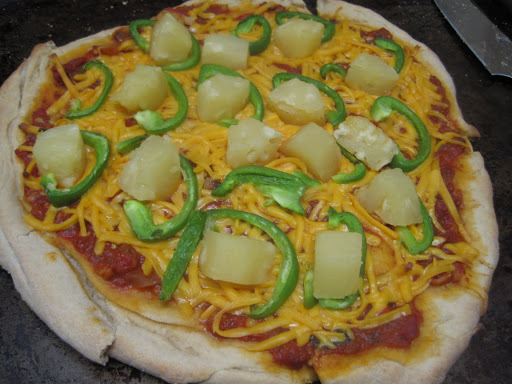 My favorite pizza topping combination ever is pineapple and green peppers. I’ve come to learn that this is not a normal pizza topping combination. For years, it’s been virtually impossible to convince my friends to go in for it. Honestly, I don’t know where or how I got started on this myself. I think that it just struck me as being tastes that ought to go together, and I try not to doubt my instincts. I had some nice farmer’s market peppers and a can of pineapple chunks (I drained the juice into some Tupperware and put it in my freezer — you never know when you might need a cup of pineapple juice). While I was cooking this, I heard a scary explosion in my oven. I really was convinced for a moment that there was some kind of gas leak or something, and I would be blown up in my apartment, and never get to see the end of season two of The United States of Tara (tragedy!). But no. Actually, my brand new (used) pizza stone had split into three pieces. Stupid me! I don’t even have a gas oven! I should have read up on the internet. Turns out, you should have the pizza stone on the bottom of your oven as it heats up, because putting a cold stone into a hot hot oven causes stone death. I was a little bummed, but I had another pizza to make, so I kept on. Now, the crust on that first pizza struck me as a bit too plain. Pretty good, actually — good texture, simultaneously crispy and soft — but a little boring nevertheless. So for my next pizza, I melted a little vegan butter, mixed in some garlic powder and a little bit of salt, and brushed it on the crust. 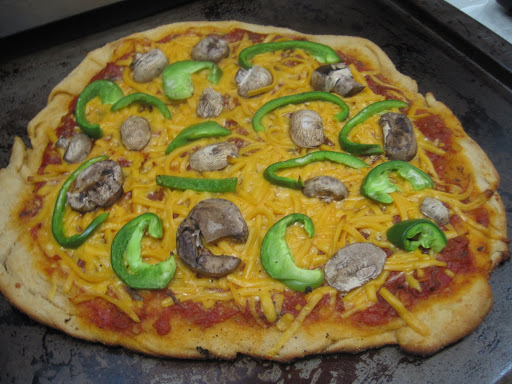 The second pizza would be peppers and mushrooms. Now sans pizza stone, I cooked it on some parchment paper on a cookie sheet on the lowest possible shelf in my oven and cooked it a little shorter, about eight minutes. Oh my god, adding that butter on the crust made it so much better. Next time, I’m brushing that all over all the dough before putting the sauce and everything on. And look at how beautifully golden it is! Nice, right? And, you know, a pizza stone really is not necessary. I think I’d rather get myself a cast iron skillet and make deep dish pizza crusts instead of a new stone. This pizza was rockin’. Also, it’s hard to tell, but both pizzas are quite large. Definitely pizza party-worthy. I also made some more doughnuts! Better this time. 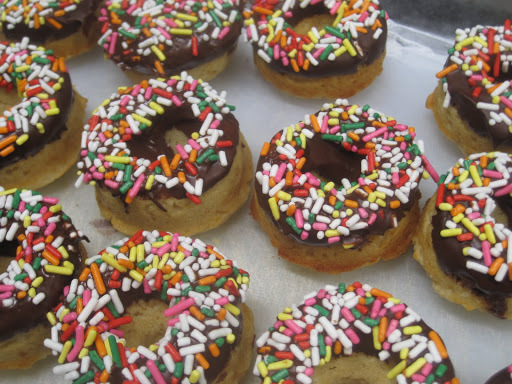 I used less dough in each doughnut and dipped them all in my delicious melted Enjoy Life! brand soy, dairy, and gluten-free chocolate chips. With sprinkles, for pretty-making! See how cute they are? Food and Loathing Returns with Some Red Gunk!